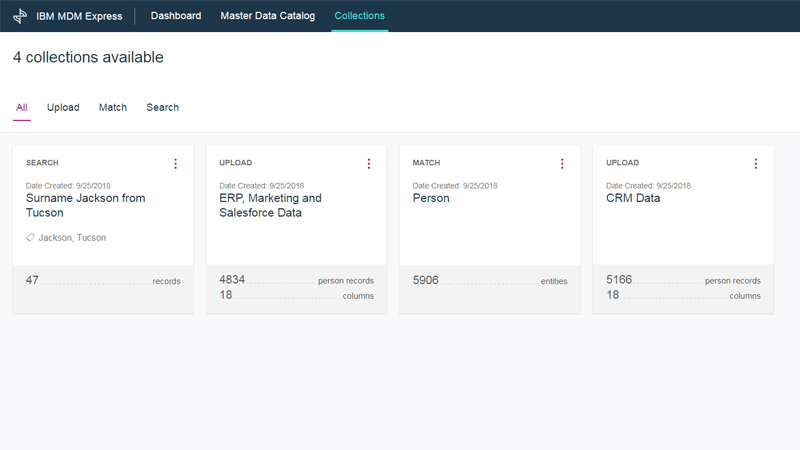 Bringing customer data together is easier than ever before with this master data management solution. Get accurate customer information and faster time-to-market when you deduplicate and consolidate customer data from multiple sources within minutes. Machine learning and consent management capabilities provide advanced insights and help you comply with regulatory guidelines. Empower business users with self-service capabilities to optimize business processes and identify new opportunities. Deploy in a matter of hours with minimal IT dependency. This solution makes it easy to add, work with and share data across business systems and downstream processes. Whether you’re a small business leader or the manager of an enterprise sales and marketing department, IBM Master Data Management Express can help increase revenues and reduce the cost of merging data together. Get a consolidated view of customer data from multiple sources, within minutes, with minimal IT dependency. Overcome duplication of information and easily export downstream. Make efficient use of campaign budgets to target the right prospects. Reduce redundant mailings and optimize media investment by moving from cost-per-lead to cost-per-member. Use machine-learning-assisted capabilities to learn from data-steward decisions. Ingest data from disparate sources to speed the import process and deliver more advanced insights. Embedded consent management lets you capture, view and maintain consent data and act on events. Strengthen compliance with regulatory requirements and foster customer trust. 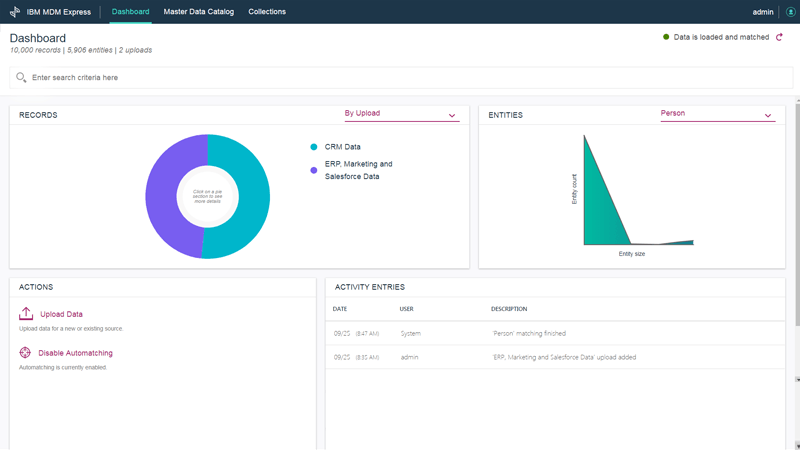 Control is now in the hands of your data stewards, thanks to IBM's intuitive light-weight stewardship user interface. Easily override system-based matching by linking and unlinking records or entities, or create, update and delete records. Marketing line-of-business users can segment their customer data based on specific demographics and characteristics. Take full advantage of IBM’s industry-leading matching technology, which is specifically designed for data that has not been standardized. Make it easy for your team to find the value that’s hidden away in your data. 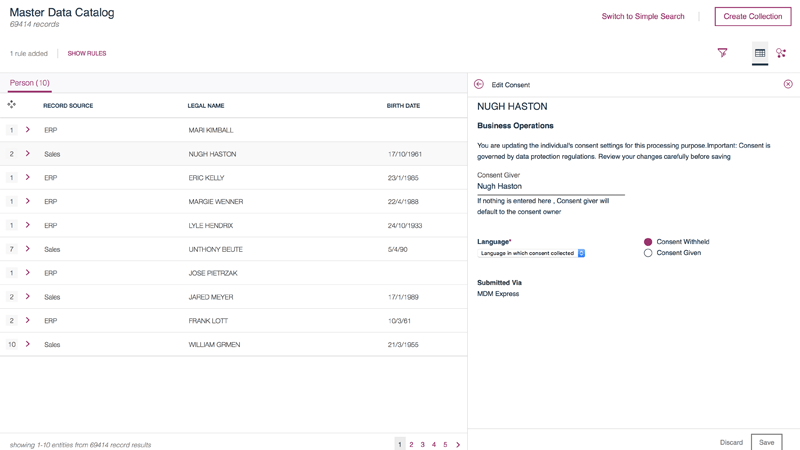 Search, view and export some of your matched customer records — or all of them. Put an end to multiple outreach efforts to reduce the cost of your campaigns. Increase revenues with a 360-degree single customer view. Give your team the ability to add customer consent values, view consent and edit consent. 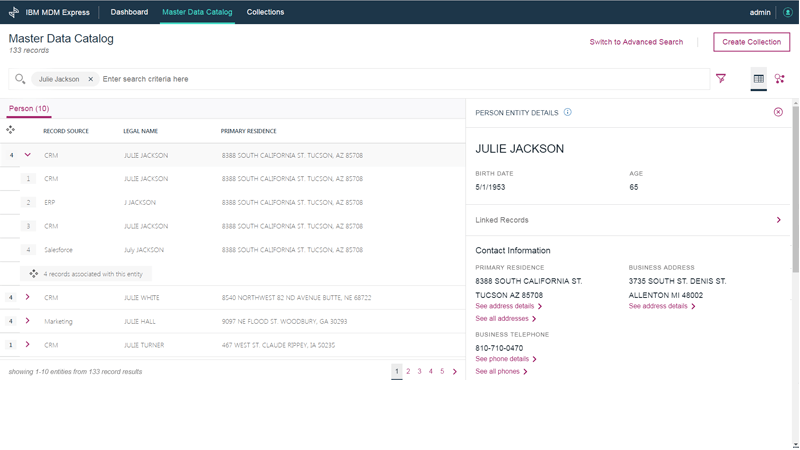 You can view and edit the consent settings of person records and entities with just a few clicks. REST APIs are a powerful way to search, retrieve and update customer data. Expect easy exporting of mastered data for downstream use in analytics, big data, reporting and more. Walkthrough and demo how the MDM Express REST APIs can be leveraged for Operational MDM use cases. Discover what your marketing campaigns are missing and how to identify prospects in minutes using machine learning-powered technology. Get advice from industry peers, communicate with MDM experts, and stay up-to-date on the latest from IBM. Find answers quickly in MDM Express product documentation. Learn more about technical support. Master the art of providing trusted master data management. Create a single, up-to-date repository of product information. Gain a trusted view of customer and product data in a hybrid computing environment.